I was busy washing my heap of make up brushes the other day and started to ponder on which ones I couldn't live without, I know, things are getting deep here today! Seriously though, finding brushes you like is a big trial and error process, I have so many in my collection but definetely have my faves that I use daily. Looked after well make up brushes will last you ages so its important to care for the little darlings. I tried to decide between these two brushes but couldn't so IMO they are both must haves, you've probably all heard about them loads already but lets discuss their greatness again. They're the Mac 217 and the Mac 224. The 217 I know for a fact I have spoken about here before but just to reiterate my point, this brush is just blending perfection, I use it every single day. Washes of colour, building colour, blending, crease work, this brush does it all. I love them so much I own two. One for each eye right? The 224 is relatively new to me but I have been loving this one because of its tapered shape, it really gets right in there and blends it all out beautifully. Mac brushes are pretty pricey, the 217 is £20 and the 224 is £23 but like I said, I personally think this is worth it as they will last you so long. I've had my original 217 for several years now and although the writing has worn off it still washes up lovely and works just as well as my new one. Next up is a base brush- the Morphe Deluxe Buffer Brush (M439), this is a super chunky buffing brush. I've tested many a buffing brush in my time and for me this is the best, an absolute steal at £11.50 too. The bristles are packed in tightly so you really get that flawless look, I personally like this best for a full coverage look and spend my time really buffing in the product. Sticking with base I have the Sephora Pro Airbrush Concealer Brush #57 which I use for, you guessed it, concealer. The Sephora brushes aren't the cheapest, this one is $24, but the quality of them is great and worth the money in my opinion. I've had this one for nearly a year now and its become my favourite way to get a smooth concealer application under my eyes. It's really soft and the product blends in well. Only issue is that its a bit of a bugger to travel with as the handle is abnormally long but lets be honest thats only a little niggle. My last favourite brush is also the prettiest one I own, its rose gold with white bristles *heart eyes* so even if it was crap it would still look that part in my collection. Fortunately its the opposite of crap- its the Real Techniques Bold Metals 300 Tapered Blush Brush and costs £19. This collection has been out for a while now and its a higher end range compared to the normal Real Techniques brushes. I don't actually use this for blush but I find it works perfectly day to day applying bronzer in the hollows of your cheeks for a subtle contour. I reach for this every single day without even thinking about it- nothing else does the job as nicely. It also washes up so well, the bristles go back to being bright, bright white. 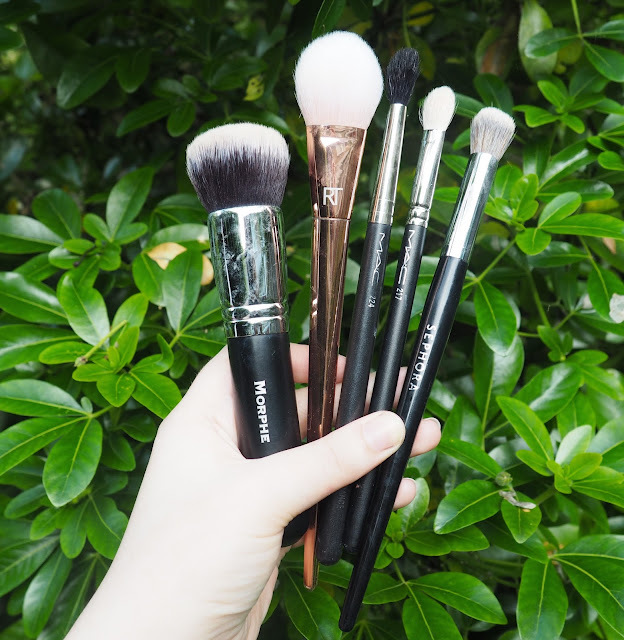 Are any of these your favourite brushes? Or if you have any ideas of others I might like then please leave a comment! I love the blush brush in the bold metals and my other favourite is their contour brush oh my, it's my holy grail!